Petersen houses an array of historical vehicles yet the museum itself has quite a history. Located on the corner of Wilshire Boulevard and Fairfax Avenue, the building designed by Weldon Becket has lived at one of LA’s busiest intersections since 1962, opening as a Seibu Department Store. In 1965 ownership shifted and the building became Ohrbach’s Department Store until 1986. The building then stood vacant for 6 years when magazine publisher Robert E Petersen decided it would be a perfect site for a museum, as artifacts could be displayed without danger to damage caused by direct sunlight and ultraviolet radiation. The museum flourished in its original structure for 20 years when museum directors decided it was time for a makeover. It was closed it in late 2014 for the building of its new facade, designed by architectural firm Kohn Pedersen Fox, and renovated interior, by designers at The Scenic Route. Petersen Directors wanted an exterior unlike any other building, one that would capture characteristics of the museum’s passion, the automobile. 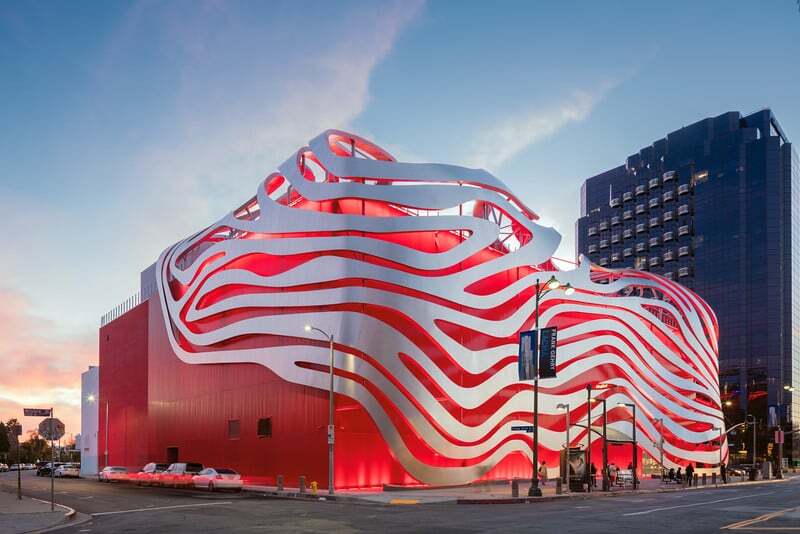 Cherry paint now covers the building, and 100 tons of stainless steel ribbons wrap around the museum (inspired by the visualization of fluid dynamics, the way air flows over a car). Being located on one of the busiest intersections of one of California’s busiest cities had its advantages as well as disadvantages throughout construction as millions were able to witness the process of the building changing, but extra caution and stress was added to the construction process which was already tricky with its unique design. The steel structures had to be fabricated in Kansas city, transported to Los Angeles, then put together at the busy attraction. The $125 million renovation took a little over a year to complete, giving the building a fresh, cutting edge look, as well as a fun one to spark the curiosity of car-lovers, young and old. Its reopening at the beginning of December 2015 brought great excitement to anticipating visitors. It has since remained the perfect place for those with a curiosity and passion for the art of automobiles, and the culture that has shaped them throughout history, but their impact on society. Visitors from all over the world are coming to LA to see the Precious Metals Exhibit and the Cars Mechanical Institute, only two of fifteen exhibits currently on display at the Petersen Automotive museum. The museum constantly rotates its exhibitions, displaying around 150 cars of its collection of over 300 cars at any given time, making it a place to keep coming back to. The museum displays a mix of its own collection as well as cars loaned from around the world. Being a non profit educational institution, it is a “perfect tax deductible home” for many to store their prized automobiles. The museum provides 4 floors dedicated to various displays; the history floor, industry floor, artistry floor, and the vault. The history floor educates visitors of the evolution of the automobile, the industry floor provides a look inside the automobile’s social, economic, political, and environmental impact, while the artistry floor highlights the beauty of the designs and aesthetics of automobiles over time. The vault exclusively stores the remainder of the Petersen’s collection. The museum’s rarer and highly prized vehicles reside within the vault, which is open to the public to tour for an additional cost.